Don't have time? Let us come to you...for FREE! Our qualified staff is here to minimize your time and expenses by replacing or repairing your windshield at your home or office. Call us to schedule a tech for your repair - (209) 668-7509. Our auto glass repair technicians can usually fix a windshield in about half an hour, depending on the degree of damage. Call today for an appointment to bring your vehicle to our auto glass repair shop - We're open 7 days a week. Click here for our convenient Turlock location. We guarantee satisfaction with every project, and we will gladly beat the prices of any other windshield repair center in town. Small rock chip in your windshield? Most chips can be repaired, if the damage is not in the driver's line of vision and is smaller than the size of a silver dollar, including any cracks. The majority of insurance companies will waive your glass deductible and pay us directly for repairing your stone chip. 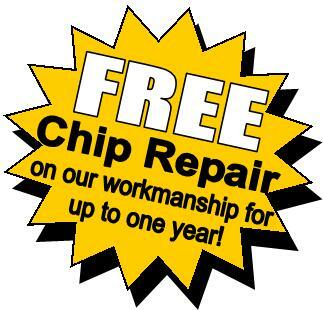 If you choose not to use insurance, we can provide chip repair service at a fraction of the price it would cost to replace the windshield! Your windshield plays an important role in the structural integrity of your automobile. While we try to repair as many windshields possible, sometimes a windshield is just too severely damaged and will have to be replaced. We can help. Our shop is fully stocked with an extensive assortment of OEM and aftermarket windshields and glass components. All work is guaranteed and bonded. Each new windshield we install comes with a lifetime warranty that covers leaks, noise and weather stripping. We are approved by all major auto insurance providers. We bill your insurance provider directly, so you get your windshield taken care of with either no money out of pocket or just the cost of your deductible, if applicable (see our coupon here for $50.OFF your insurance deductible!). If you do not have auto glass coverage, our windshield repair and replacement services are affordably priced (we will beat any local market price) and we accept cash, checks and all major credit cards.